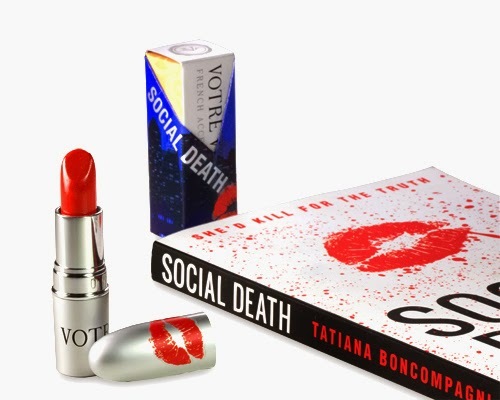 Votre Vu is launching a Limited Edition shade of French Kiss ($ 23 available exclusively at Votre Vu) to mark the release of Tatiani Boncompagni's SOCIAL DEATH, a scandal packed murder mystery set in Manhattan's lipstick referencing the setting and graphic cover image. It's a incredibly wearable red that NYC Heiress, SOCIAL DEATH offers readers a glimpse into the high stakes word of high society and breaking news. "Red lips have always been a symbol of intrigue, glamour and seduction. In a nutshell, that is exactly what SOCIAL DEATH is about, and why I think this is such a perfect partnership," says Boncompagni. This lippy was made for me! Creamy in formula and texture and also has a bit of gloss in it. This custom created warm shade of classic red will go with anything and everything. Put a little glamour on your lips with Votre Vu's SOCIAL DEATH.